RESOURCE CENTRE Localisation: Partnership Chronicles. 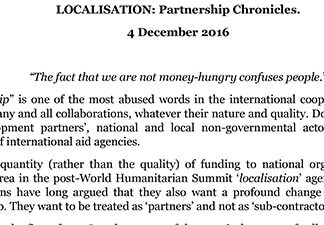 “Partnership” is one of the most abused words in the international cooperation jargon. It stands for any and all collaborations, whatever their nature and quality. 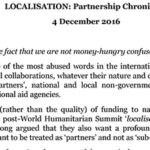 Donor governments are ‘development partners’, national and local non-governmental actors are invariably ‘partners’ of international aid agencies. Please download this from here.